Scary spider cakes are a great way finish off a frighteningly good Halloween meal. They also make excellent party buffet centerpieces, donations to bake sale fundraisers, and special treats for a child's classmates during a spooky school event. This simple spider cake is easy enough for almost anyone to make, but is also a lot of fun to jazz up if you are an experienced decorator. The top of the cake has a spider web design, created with icing. Plastic spiders add an eerie touch that will have your guests shuddering in fear and then digging in for a sweet fix that is anything but spooky. Ice a cooled cake layer with chocolate buttercream icing, covering the top and sides completely. Smooth the icing with an icing spatula or scraper. Using a cake turntable can make smoothing the icing easier. Spin the cake as you slide the flat edge of the spatula against the side, removing any bumps and ridges as you do. Once the chocolate icing is smooth, you will need a piping bag filled with white icing and fitted with a small round tip, number 3 or smaller. Start at the center of the cake by piping one small circle about the size of a dime. Leave about a half an inch of space between the edge of your first circle and your next starting point. Draw another circle completely around your first. Work in this fashion until you have drawn a bulls-eye like design that boasts several circles and covers the entire top of the cake. Set the tip of a toothpick at the immediate center of the first circle you created, and with one swift motion, pull the tip in a straight line out to the edge of the cake. Repeat this step eight or ten times, going in a different angle from the same starting point each time. As you do this, the icing circles will be pulled together at the dragging point to create a web-like appearance. Finish off your cake with plastic spiders on the top of the web. You can purchase these at any party supply or hobby store, especially close to Halloween. You could also place a couple on top and trail the rest of the spiders down the sides. For a cake that looks like it is going to get up and walk off the table, try this spider cake with chocolate covered pretzel legs. Take your pick of which parts of the spider you eat. They are all delicious. "Glue" your two cake layers together with a generous layer of chocolate buttercream icing by placing one cake layer on top of the iced bottom layer. Allow to chill in the freezer for about 20 minutes. Remove your chilled cake and use a serrated knife to trim off the top edges of the top layer of cake to give the shape a more rounded, dome-like appearance. Ice your rounded cake with chocolate buttercream. You can smooth the icing and add chocolate sprinkles or create a textured spider body by gently tapping the wet icing with your spatula all over the surface. Melt about half the candy melts or almond bark in a double boiler or in the microwave until it is completely smooth and easy to stir. Dip each pretzel rod in the melted chocolate, making sure each rod is covered completely. Lay each rod on wax paper to harden, leaving plenty of space between to prevent the pretzels from getting stuck together. You can speed up the hardening process by placing the coated pretzels in the fridge for about ten minutes. Once the coated legs have hardened, on a new sheet of waxed paper, match up eight of the dipped pretzel rods with the other eight, placing them so they connect in the center and form a 90-degree angle in an L-shape. Melt a handful of candy melts or almond bark and fill a small piping bag with the melted candy. Snip a small hole in the end of your piping bag, no larger than a few millimeters. Pipe a generous bead of the candy right at the joint of each pretzel leg to bind them together. When you are finished, you should have eight L-shaped "legs" that are covered with candy. Allow to cool in the refrigerator until chocolate has completely hardened. Carefully place four legs along each side of your already iced spider body. Pick each leg up very carefully to prevent breakage as you work. Push one end of each leg into the side of your cake and allow the other end to rest on the cake plate. Using a piping bag filled with white or chocolate icing and fitted with tip number 3 or smaller, add the eyes and other facial features to your spider. Goofy-eyed licorice cupcake design: These little spiders are made with licorice for legs and icing and bits of chocolate for eyes. The icing has been sprinkled with chocolate sprinkles to create a fuzzy spider look. However, you could easily duplicate this design on a larger scale by baking a small cake and adding thicker pieces of licorice for the legs. Mama and baby spiders: Cooking Channel offers detailed directions on how to make this elegant-looking spider cake. It features little spiders made out of chocolate ganache. Your guests will think you spent hours upon hours on this cake, but you'll be able to complete it in just a few short hours, including bake time for the cake. 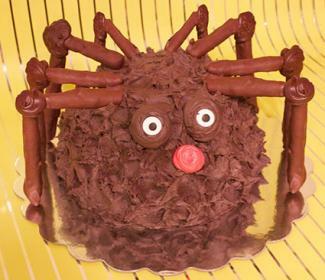 Kooky spider: This cake is perfect for an event with children. From his star tip icing body to his goofy candy corn grin, he just screams funny and friendly. Wilton lists all the supplies you'll need and simple instructions for how to complete the look. Spiders are anything but simple, with their intricate webs and unique physical makeup. However, making a spider cake doesn't have to be difficult. 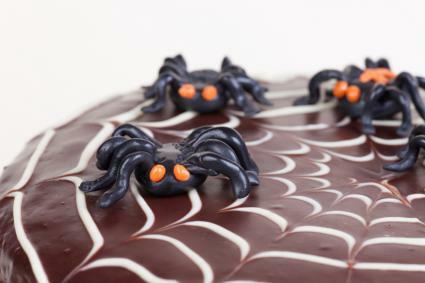 It can be as simple as adding plastic spiders to a store-bought cake or as complex as molding decorations from ganache. Whatever you choose, a spider cake is sure to be a hit at just about any Halloween event.